If you have just introduced a mobile medical computer cart to your office or hospital, or if you are new to this technology, you may be wondering how to utilize your cart for patient care. 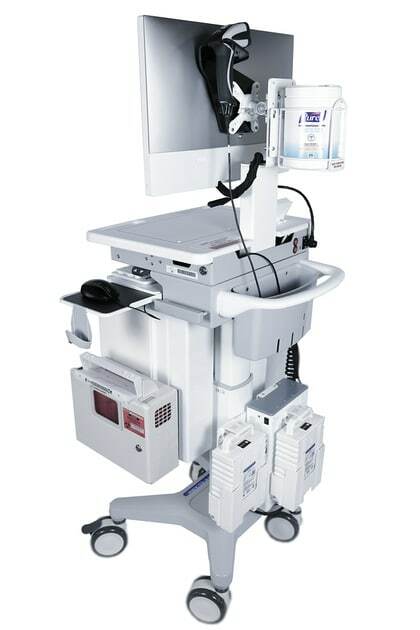 Mobile computer carts have become an incredibly useful tool at increasing efficiency in the healthcare environment while allowing professionals to deliver more quality direct care to their patients. They cut down on time spent at a nurses station or tracking down supplies and information so you can spend more time talking with your patients each day. One of the best things about the mobile medical cart revolution in the healthcare industry is that data can be entered on the spot with a patient. Nurses and doctors can take time to review test results, enter health information, and clarify things with the patient directly. Many doctors are also using their computers as an opportunity to educate patients by utilizing reference materials online to help explain complicated medical conditions or tests. This adds to the overall patient experience of care, creating quality over quantity. The ability to access and input data with the patient in the room also cuts down on time spent entering data later on, sometimes after the end of your shift. If you have a family to get home to, you know how precious that time spent entering information into a computer can be. Many healthcare offices and hospitals customize their medical computer carts with other features, including locking storage and medical drawers, sharps disposal containers, and vital signs equipment. This allows healthcare professionals to take their tools with them and remain stocked up on supplies. This can be especially important in small patient care areas that may not have a lot of storage options. 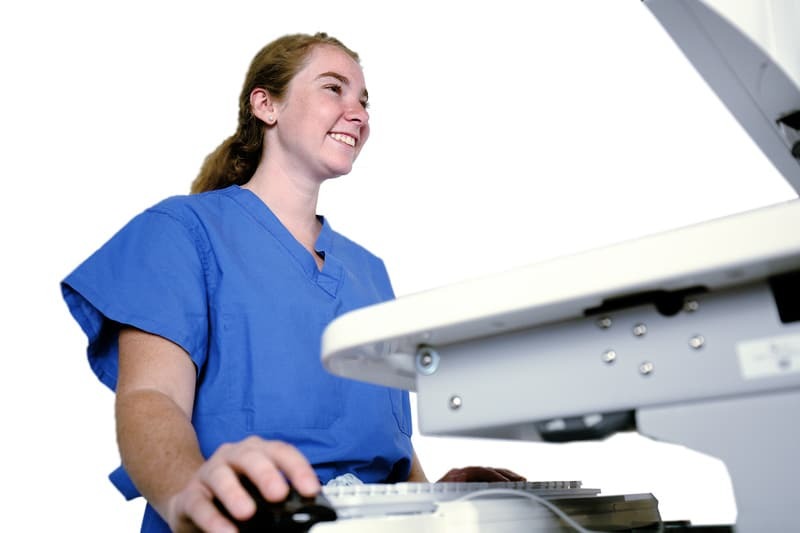 The versatility of a medical workstation on wheels is crucial to a fast-paced environment. Most wheels on these workstations are designed to roll easily over any flooring, including carpeting and tile. The wheels on these carts also swivel, making tight turns and maneuvering through crowds a breeze. Most importantly, they are easily placed in any location, even in small patient care rooms or crowded hallways. These carts are designed to be lightweight and easy to move, and many can be adjusted to the height of any user. Many carts are equipped with hand sanitizer wipes or gels for continuous germ-prevention practices. Point of Care mobile carts can be designed with limited plastic surfaces which can be a breeding ground for MRSA and other germs. Additional customizations for medical computer carts include sharps disposal boxes and trash disposal. One of the biggest benefits to using a medical computer cart is reducing costly, or even dangerous, data entry errors. According to a 2012 study, medical errors cost the American healthcare industry an estimated $19.5 billion in 2008. Many of these errors resulted in missed work, additional medical procedures, inpatient and outpatient care, and even death. The importance of ensuring that patient information is entered into the healthcare records system correctly cannot be overstated. It is to the benefit of healthcare providers, patients, and insurance companies to make a concerted effort to reduce these errors. The rate of errors declines dramatically when healthcare providers can enter the data at the point of care. Most medical workstation on wheels come equipped with long-lasting battery power to follow you wherever you’re headed next. Batteries typically last between 6-10 hours, depending on what they’re powering. For small laptops and tablets, the batteries can last even longer. Hot swap battery systems provide a quick switch of batteries for the cart, minimizing disruption to your shift or work. A medical computer cart may not sound very fancy, but it can drastically change the way you run your office or perform your daily job duties. Increase efficiency while increasing quality patient care with a mobile computer cart in your healthcare environment today. Learn more about what the Scott-Clark Medical team can do for you and contact us today.